C.R. Jackson, Inc. is a great company to work with. I have worked with them over the past 10 years and have always found them to be professional, courteous, and a pleasure to work with. Their quality, schedule, and cost value are top notch. Their team always met any challenges with a solution for us to discuss. Land clearing and grading is the component of site preparation that C.R. Jackson has been completing for the past 40 years – this is the first scope of work for which our company was contracted to perform. 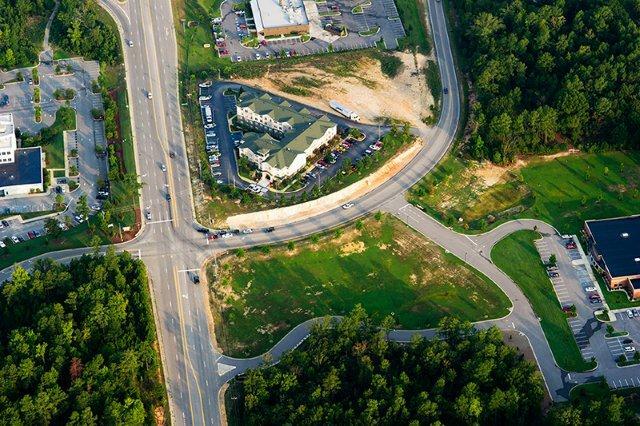 Based on these many years of experience, our highly-trained operational, land clearing & grading staff can expertly clear a raw piece of wooded property, remove trees to prep the site for other processes (such as asphalt paving and storm drainage), and grade the land according to design plans. There is no site with a quantity of dirt too large for our abilities - C.R. Jackson utilizes GPS-controlled grading equipment that allows us to increase production and accuracy. This state-of-the-art equipment allows us to reduce the amount of surveying that has to be completed and reduce the possibility of rework. This is just one area where we improve efficiency and increase cost savings for the customer on clearing and grading projects. If your jobsite requires material to be hauled in, C.R. Jackson has access to our own borrow pits and trucking fleet, thus reducing the need for additional contractors. Finally, our CEPSI-certified personnel are qualified to install and maintain erosion prevention and sediment control items. This eliminates the need for a separate certification to be performed by other firms. These efficiencies allow C.R. Jackson to be more competitive in the bidding market and often provide a shorter project schedule for our clients. We begin a land clearing and grading project with a set of drawings from the customer or a project management team. Our estimating team’s careful review of these plans allow us to properly assess the property and set specifications for the project. We determine the process that will be best suited for the removal of material following the clearing of the site. The long standing relationships that C.R. Jackson has with local and state agencies in South Carolina enables the required permitting process to be as simplified as possible. We follow excavation rules among other standards set forth, and we also have personnel who have completed competent person training. Contact us to learn more about our land clearing services. You may also be interested in our asphalt paving, storm drainage, and roadway construction services.